Anaheim, Dec 28, 2018 (Issuewire.com) – January 2019 is right around the corner with plenty of people setting their New Year resolutions to change diets, workout schedules, start a new career, and maybe improving their home with a brand-new kitchen! Thankfully, Mr. 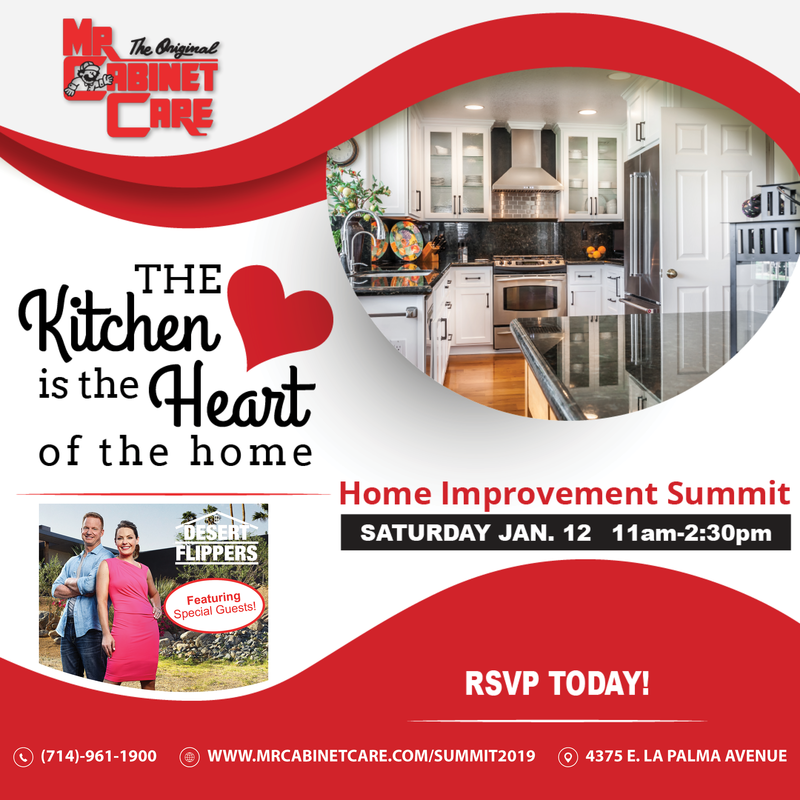 Cabinet Care, a family-owned Kitchen Remodeling company, will be hosting The Home Improvement Summit featuring Special Guests HGTVs Desert Flippers Eric and Lindsay Bennett! The Summit will focus on educating homeowners on current trends in kitchen upgrades, home renovations, kitchen appliances and flooring choices! 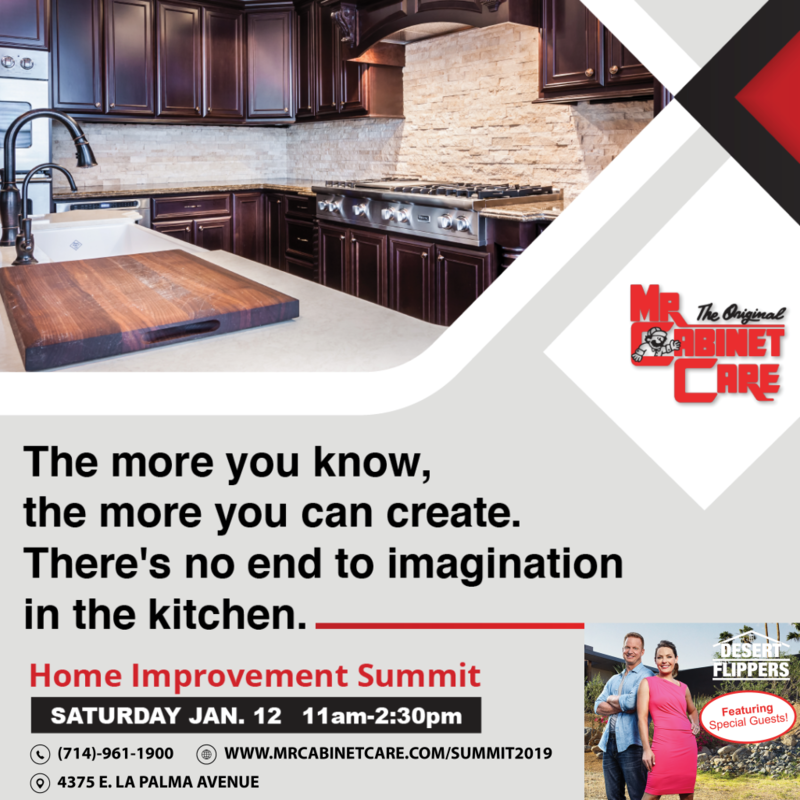 The Home Improvement Summit: 2019 Kitchen Trends will take place on Saturday, January 12, 2019 from 11:00 a.m. to 2:30 p.m. at Mr. Cabinet Care (4375 E. La Palma Avenue, Anaheim, CA 92807). While this event is free to all attendees, RSVP is required due to limited seats available! While learning about the current kitchen trends, attendees will be educated on how to create a home remodeling planner/checklist, the opportunity to meet kitchen designers and product experts, food & beverages, sign autographs, take pictures with our HGTV Desert Flippers celebrities and more importantly enjoy a fun day full of prizes, special promotions and giveaways! Special guests will also include Pacific Sales and Floor & Décor with their professional staff/experts. They will impart trends in kitchen appliances, flooring and backsplashes! Attendees will have the opportunity to participate in winning giveaways, money machine and raffles! By opting to schedule a Free In-Home Estimate, attendees will be entered to win prizes from each vendor, promotional event coupons, swag bags, and a grand prize of winning $5,000 towards your dream kitchen renovation! For more information about the Home Improvement Summit and to reserve your free spot, please visit the Eventbrite page at https://bit.ly/2SnMnuD. To learn more about Mr. Cabinet Care’s event, please visit https://www.mrcabinetcare.com/summit2019/ or call 714-961-1900. Established in 1987, The Original Mr. Cabinet Care has become one of Southern Californias largest and most trusted kitchen remodeling companies. Mr. Cabinet Care specializes in Kitchen Remodeling, Cabinet Refacing. Quartz and Granite Countertops. The family-owned operated company started in a modest 1,500 square foot shop in Santa Ana, CA and has grown into their current 24,000 square foot factory and showroom in Anaheim, Ca. The Original Mr. Cabinet Care has satisfied over 19,000 clients and has been voted the #1 Kitchen Remodeling Company. In addition, they are Californias only 12 Time winners of the Peoples Choice Award.